With the new year just around the corner, now is the time to plan for your Q1 marketing efforts. Why not consider a website design refresh as part of your strategy? A brand new look or website makeover could help you make a splash and come out of the gate like a rock star in 2019! To help get your creative juices flowing and introduce you to what’s possible, we thought we would look at what’s on trends for website design in 2019. Speed — While speed-to-market is huge with product development, load speed is the critical goal for website performance. If you have a website that takes more than 3-seconds to load, then you have a problem. Consumers don’t wait…if your site is to slow, they’ll find another one that’s not. Zero UI — A few years ago, designers started holding back on design and began moving towards cleaner, flatter designs. This change allowed for more websites to be accessible via mobile devices. The introduction of Responsive Design pushed this trend into a best practice. 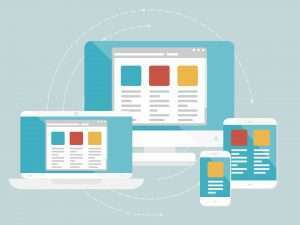 Now, with more and more users turning to their smartphones and tablets instead of laptops, Zero UI website designs will be a must for success in 2019. Mobile First — Speaking of mobile-friendly designs, due to the increased use of mobile users, Google now searches mobile-friendly websites first. If you want to continue to rank well in Google, then design with the mobile experience in mind and work back towards the laptop experience. Single-Pane Design — This is a huge trend and one we are seeing many companies move towards. It’s minimalism at its finest! Essentially you take a multiple page website and turn it into a one-page website. A twist on this, that we’ve seen, is to have your home page become a stronger, ‘single-pane’ design, housing 80-percent of what a user will look for and then lay out the rest of your web pages. This allows the user to quickly find what they want, makes it easier for Google to crawl your website, and increases your load time. Video Backgrounds — Banners and website headers are taking a big step forward with the addition of video. The use of video in the background gives the feeling of “being alive and connected” to a user. It instantly makes the experience more dynamic and fun. Animation and AI — Next year and beyond will see the incorporation of CSS3 Animation and Artificial Intelligence (AI) everywhere! Both are the current ‘it kids’ of the design world and seem to really excite and engage the consumer. Plus, both can be incorporated into most website designs and they display well on mobile devices. Typography — Incorporating beautiful fonts into design makes a statement and consumers are starting to respond to it! Consumers are tired of the standard looking website and are starting to react to fresh and exciting new designs. When done correctly, typography can draw the user’s eye to a specific area of the page or envoke an emotional reaction. Now is the time to play with typography and let your artistic designer flag fly! ChatBots — Smartphones have put the world in the hands of the consumers. Because of this, consumers are used to being able to get immediate answers. Chatbots help bridge the gap and allow companies to project the feeling of ‘having someone live’ available 24/7 without actually having to do so. Chatbots also help to prescreen consumer questions. While they might provide the same answers as Help/FAQs do, chatbots let consumers ask a question and get an immediate response (let’s face it…they don’t like to read or scroll around looking for answers). Vocal Engagement — Building on the smartphone rise, users expect to be able to speak into their phones and have the phone deliver the information they are wanting. While Siri is happy to deliver, most websites aren’t. Get the competitive edge by making sure your website is built and designed for vocal engagement. Let us help you come out of the gate strong and on-trend in 2019. Contact SBOS Web Solutions and let’s create a strategy to redesign or refresh your website in order to give you the competitive edge in the new year.